Falling objects carry a force that is much higher than their weight. Such high forces can cause death, injury and destruction. 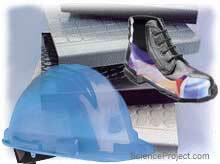 Impact resistance material may be used to reduce the impact force and prevent injury or damages. Safety helmet or hard hat, steel toe boots, rubber floors and cushioning materials used in packaging are all examples of material that reduce the impact force of falling objects. The purpose of reducing the impact force is usually protection of people or products that may be hurt or damaged due to the high impact force. In this project you study the effect of different cushioning material in reducing the impact force. You must perform a series of experiments to test the average impact force of one specific falling object on different material. More details or support on this project is available for the members of ScienceProject.com. Material needed for experiment may be found at home or purchased locally.